The industrial giant delivered another lackluster quarter of revenue growth. Is it time to give up on the stock? Another quarter and another revenue disappointment from General Electric Company (NYSE:GE). In other words, the company is starting 2017 in the way it left 2016: executing solidly, but missing revenue estimates while finding ways to meet earnings guidance from non-core sources. As you can see in the chart below, it's not enough of a formula to convince investors, and the stock price has notably underperformed the S&P 500 and its peers. What's going on, and is it reason to panic? It's useful to look at a timeline showing how organic revenue growth guidance changed throughout the year. As the table illustrates, expectations were incrementally lowered as the year progressed. In the end, organic revenue growth was flat, or 1% if you include the Alstom assets acquired in November and December of 2015 and 2016. In addition, the fourth quarter was particularly disappointing, with core organic industrial revenue declining 1%. To be fair, GE's full-year operating earnings per share (EPS) came in at $1.49, a figure within the $1.45-$1.55 guidance range given at the start of the year, and also within the $1.48-$1.52 range given on the third-quarter earnings call. However, as noted above, part of the reason for this was contributions from non-core areas. For example, GE's cash flow was better than expected due to full-year GE Capital dividends coming in $2.1 billion better than expected -- $20.1 billion, compared to original guidance of $18 billion -- while dispositions contributed $4 billion, compared to an original expectation of $2 billion to $3 billion. As a result, EPS received a boost as GE used the cash to increase share buybacks. For the full year, buybacks were increased to $22 billion from an original target of $18 billion given at the start of the year. Clearly, GE can't rely on asset sales and dividends from GE Capital to boost EPS indefinitely; the challenge is to grow industrial EPS in line with its overarching strategic goals. The question now is how investors should understand the 3%-5% organic revenue growth forecast for 2017. Moreover, is GE a company that's scrambling to meet earnings expectations, only to ultimately flounder on the way toward its target of $2 in operating EPS in 2018? On balance, I believe GE is still on track, for three reasons. First, the revenue growth reductions have largely come from oil and gas, and GE isn't the only company to have been overly optimistic with regard to guidance. Meanwhile, the rest of the industrial business is growing at a good rate. For example, excluding oil and gas, and including Alstom assets, organic revenue growth was 8% in the fourth quarter. In addition, a GE competitor in oil and gas, Dover Corp, has seen the beginnings of a recovery in its early-cycle oil and gas business. GE CFO Jeff Bornstein expects the first half of 2017 to be "challenging," but sees "sequential improvements in the second half of the year." Indeed, organic oil and gas orders grew 2% in the fourth quarter, with CEO Jeff Immelt pointing out it was the "first growth in two years." Second, organic revenue growth, including Alstom assets, was 4% in the fourth quarter -- pretty much in line with previous guidance. While it's easy to conclude that it's down to acquisitions (without Alstom, organic revenue declined 1% in the quarter), the fact is that integrating Alstom is a key part of the company's strategy, and investors should judge it as such. Moreover, according to Immelt on the earnings call, "Alstom synergies are ahead of plan" and GE has managed to strongly increase order growth, with Alstom equipment orders growing "four times" and service orders up 61% organically. So organic revenue growth was 4%, and GE is targeting 3%-5% in 2017. In other words, it's already on track. Third, the power business was a bit weaker than expected, but management believes the reasons for this are transitory. Bornstein noted that "the business shipped 104 gas turbines this year; we'd expected to ship 110 to 115. We expected to ship six more units but those transactions did not close in the quarter, but we expect that those units will close in 2017." Immelt later explained that four of these turbines were going to Bahrain and Iraq -- not easy places to ship to -- so some delays are understandable. The other two were for West Africa, where, according to Immelt, the customer is considering buying a larger H-class turbine from GE instead. All told, investors should give GE the benefit of the doubt. 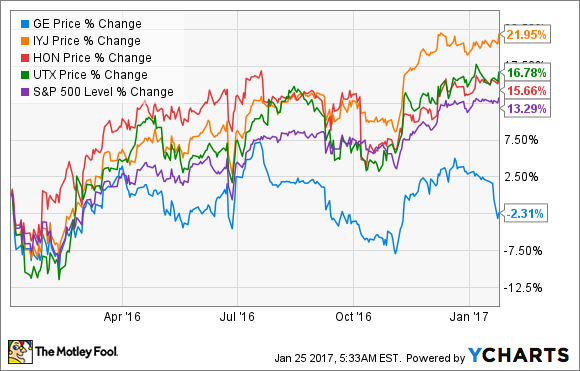 The company offers investors something different in 2017 in terms of growth opportunities from the Alstom and Baker Hughes deals, while ongoing Industrial Internet of Things initiatives promise a great deal of future growth. However, GE needs to start underpromising and overdelivering on revenue forecasts, otherwise investors will start to get nervous about its 2018 target of $2 in operating EPS. A couple of solid quarters without any negative guidance revisions are needed in order to fully restore confidence in GE's forecasting abilities.